These running back drills focus mainly on the running back’s footwork and with that his ability to run not only straight aheady but also being able to change dircetion without losing momentum. Even though the running back mostly should be blocked for, once in a while he will be asked to block for another player running the ball. This is very obivously true for running backs playing in a 2-back system, but might also be true for plays out of a 1-back formation. The blocking skills of a running back have to be as versatile as all his other skills, as he might be asked to block an defensive end on a power play, a linebacker on an Iso-play or a defensive back in open field on a sweep-play or a reverse or just simply on a quarterback scramble. Even though it is more and more common to rather send out the running backs to a pass route, rather than blocking for the quarterback, it is still just as often that the running back has to block a blitzing linebacker or sometimes even a defensive end. 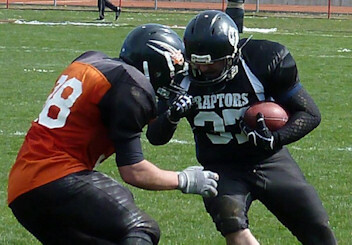 A good running back pass block starts with the correct recognition of the defensive pass rush (scheme) and therefore the recognition of the defender the running back has to block. Because the sooner the running back knows who he has to block the sooner he can approach him and block him closer to the line of scrimmage and therefore farther away from the quarterback who then in turn has more room to throw the ball and/or to move away from another passrusher closing in. Ball handling is crucial for a running back. If he can’t handle the ball well, be it taking a handoff, catching a pitch and afterwards protecting the ball from being stripped from him when he’s tackled, all his running abilities are for naught. It all starts with taking the handoff in such a way that the ball can be quickly and safely tucked away with as little distraction from running and looking at the defense. The handoff drills should be practiced over and over again and also be incorporated into the other drills until it becomes second nature to the running back to take the handoff. Additional work has to be done if you are running some kind of option where the quarterback might put the ball into the running back’s pocket but still has the option to pull it out. Here you have to work on good “communication” betweet the quarterback and the running back on when the quarterback decides to “give” or to “pull”, because if there’s a misunderstanding it most likely will result in a fumble. But taking a secure and smooth handoff isn’t enough. The running back also has secure the football all the way through. 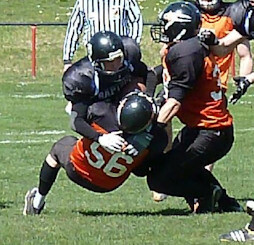 Having a good and firm grip of the ball when running and extra securing the ball when being tackled. These running back drills focus mostly on putting a running back into specific game situations and teach him the right skills for these situations, be it reading the blocks of the offensive line or on protecting the ball and himself when running along the sideline. Some of these require the running back to make good use of his agile running abilities which he aquired in the running back specific agility drills. But being agily is the one thing, knowning instinctively when and how to apply these is the next step. But often enough it’s not enough – if at all possible – to avoid the tackle, then even another ability of the running back is asked for: his ability to make yards after contact (YAC). 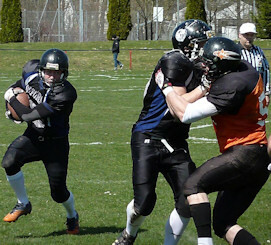 A running back is not only asked to runs as far as possible until he’s tackled but also to make as many more yards while being tackled – but of course also while protecting the football. Last not least the modern running back is just a much a receiver as he’s a ball carrier, so his receiving skills also have to be trained. Nowadays a runningback is not thought of as a mere outlet receiver anymore, somebody you dump the ball to when nobody else gets open and the quarterback runs out of time. But instead the running back is an integral part of the passing scheme, moving him around via motions or shifts even in wide receiver positions and from there he’s then also requiqued to run wide receiver routes. Beginning with running good pass routes, then catching the ball and then running with it.